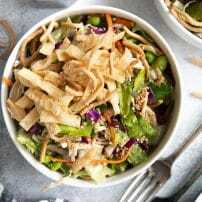 Fresh, crisp, and crunchy, this Chinese Chicken Salad Recipe is a mix of juicy shredded chicken, fried wontons, mixed greens, and the very best homemade Asian sesame vinaigrette. Enjoy this easy and delicious chicken salad as a satisfying lunch or light and refreshing dinner. 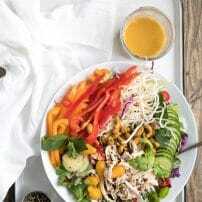 The Chinese Chicken Salad, also known as, Oriental Chicken Salad or Asian Chicken Salad, is a popular entree salad served throughout the United States. 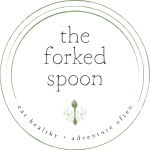 Despite a name implying that it has its origins from China, it is, in fact, a melting pot of ideas, recipes, and ingredients believed to have originated in California at a restaurant called Madame Wu’s in Santa Monica. The first time I ever ate a Chinese Chicken Salad was at The Cheesecake Factory well over a decade ago. Piled so high with crispy rice noodles, I couldn’t understand how one person could possibly eat such a salad (yet, I did, and have many many times). Typically made with ingredients such as lettuce, cabbage, chicken, and some kind of fried wonton or rice noodle, the ingredients may range from simple to complex depending on restaurant and preference. 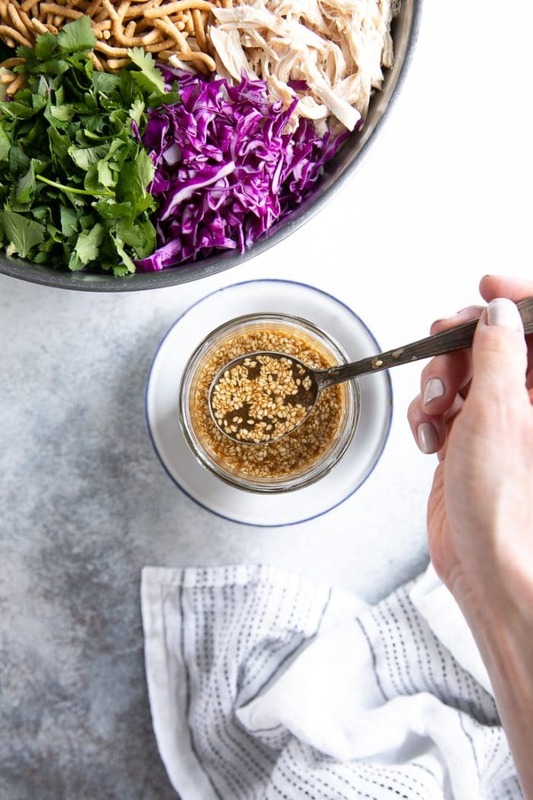 With heavy Asian influence in the vinaigrette, you’ll find ingredients like sesame oil, rice vinegar, soy sauce, ginger, and garlic. You guys, this is one of those unexpected amazing salads. Like, it looks just ok on the outside, but you take a bite and whoa! The crunch combined with the mouthwateringly good vinaigrette, you literally won’t ever want to stop eating. 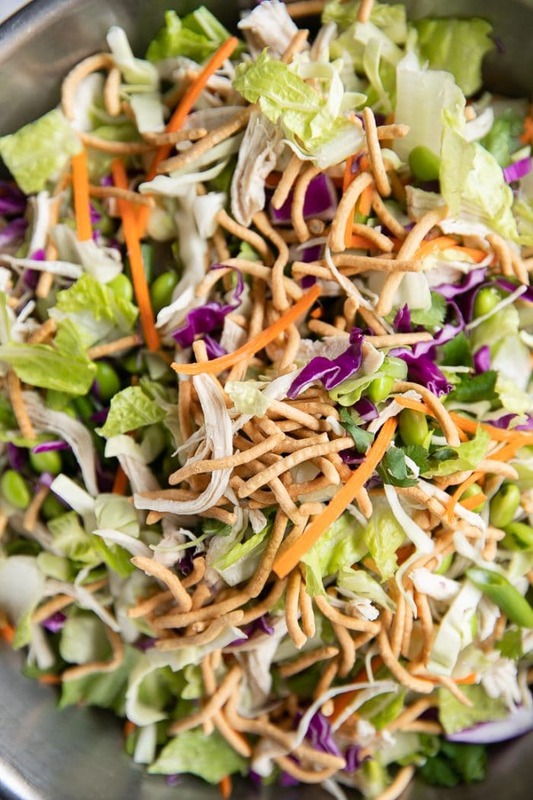 There are two parts to making a Chinese Chicken Salad – the actual salad and the Asian sesame vinaigrette. Each is equally important in making an amazing and delicious salad, and, lucky for us, each is super easy to prepare. Cabbage. I always include green cabbage in any Chinese Chicken Salad that I make. It’s crunchy and it is the perfect green for meal prepping (because, yes. This salad gets an A+ for meal prep). The trick is shredding is super thin so that you don’t get big fat bites of raw cabbage (unless you’re into that). Lettuce. Romaine is recommended. Here’s the thing about the lettuce- I like it, it adds a different level of crunch. However, it does not stay fresh and crisp for more than a couple of days. This makes meal prepping of everything a tad more difficult (but not impossible). Green onion. This, for me, is non-negotiable. I don’t typically add any other onions to Chinese chicken salads, and green onions love the Asian sesame vinaigrette, so unless you really hate green onions, double the amount you would normally add. Fried wontons. Or ramen noodles, or rice noodles. Obviously, the least healthy part of the whole salad, but a little goes a long way, so I highly recommend. Cilantro. I know some of you out there do not like cilantro, and that’s ok. Just leave it out. For those that do, however, I find that the combination of cabbage, Romaine, green onion, fried wontons, and cilantro to be a magic dream team (not just in this salad, but in many others, too). Chicken. It’s a chicken salad so you should probably add some chicken, right? Well, yes…unless you don’t care for chicken or you don’t eat chicken. In that case, leave it out. Toasted sesame oil. Make sure to use toasted sesame oil, not regular untoasted sesame oil, which is much lighter and yellow in color. Nutty, fragrant, and quick to overpower the entire dish, sesame oil provides amazing flavor when used in the proper amount. For this recipe, I added 1 tablespoon. Start with less if you’re unsure. Rice wine vinegar. Not to be confused with white vinegar or apple cider vinegar (or any other vinegar). Grapeseed oil. or any other neutral flavored oil such as canola oil. Fresh garlic and ginger. Not too much, but definitely fresh. Sugar. Totally optional. I like to add a teaspoon or two to balance the acidity of the vinegar. Prepare the Vinaigrette. 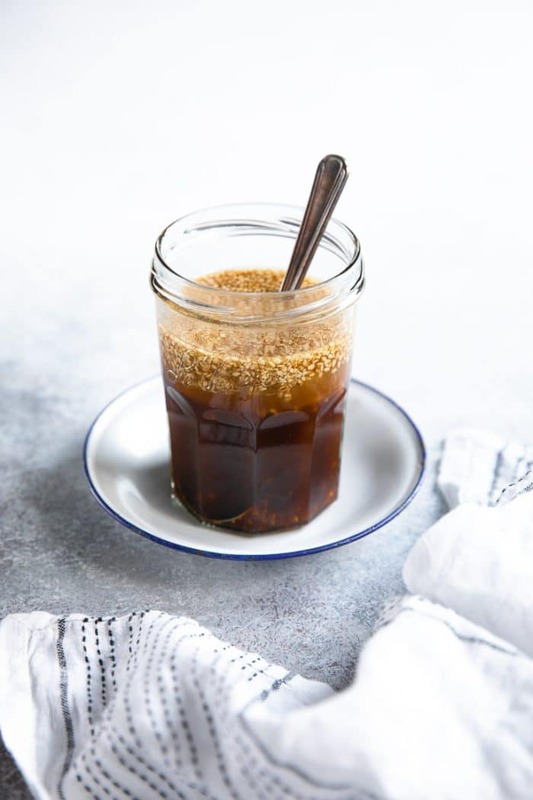 The most time-consuming part to the vinaigrette is mincing the garlic and ginger. The easiest way to work with ginger is to carefully cut away the skin and then grate approximately 1/2-inch piece on a Microplane Grater. Once the ingredients are prepped, add all the ingredients to a small jar and seal with a tight-fitting lid. Shake vigorously to combine. Prepare the Chicken. Any chicken loves a Chinese Chicken Salad. So whether you decide to roast chicken or poach chicken, it’s entirely up to you. For this particular recipe, I poached my chicken. Add the chicken, making sure there is enough water to cover the chicken by at least 1-2 inches and return the water to a rolling boil. Remove from heat, cover, and set aside to “poach” (cook) for approximately 25-30 minutes. Carefully remove chicken from the pot and set aside to cool before shredding. Prepare the salad. As the chicken cooks, get all the ingredients for the salad washed, shredded, and chopped. Add all ingredients for the salad, (including the shredded chicken when ready), to a large mixing bowl and toss well to combine. Serve. If you plan to serve the entire salad in one sitting, drizzle and toss the salad with all the vinaigrette. If, however, you plan to save some for later, serve individual bowls and drizzle with the desired amount of sesame vinaigrette. I love to prepare this salad in bulk. It’s amazing for meal prep lunches and leftover dinners. The best way to do this is to decide which vegetables you want in your salad and set aside approximately 45 minutes to get everything together. Yes, it’s a lot of chopping and depending on how fast you are, it may take more or less time, but it’s totally worth it! Use a salad spinner to wash and dry your greens. Salad spinners are AMAZING! Especially if you want to prepare chopped greens in bulk (since soggy lettuce and herbs are no good). 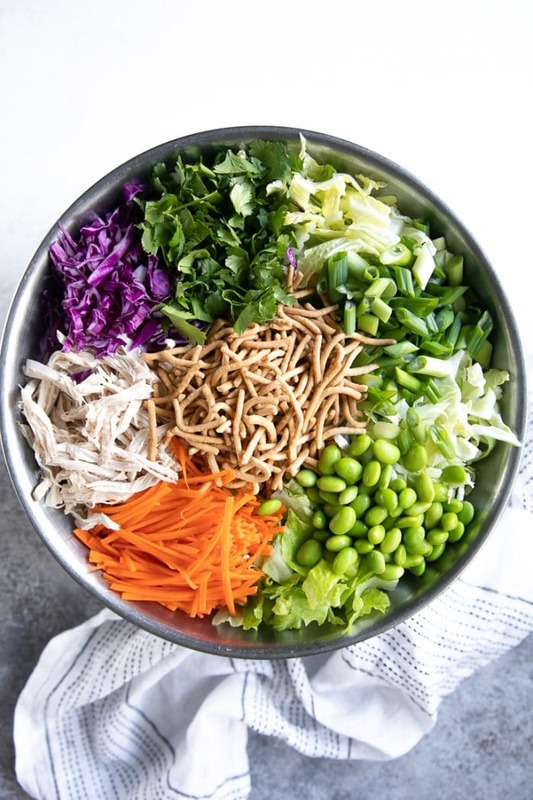 Store the cabbage in one container, the lettuce, green onion, and cilantro in a second container, the chicken in a third, and finally all the others (carrots, edamame, etc) in a fourth. 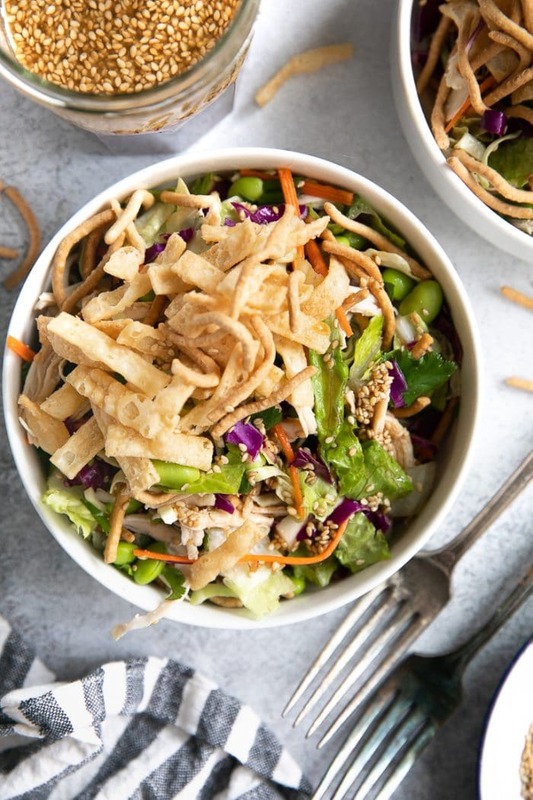 Make this salad Gluten-free by swapping the soy sauce for gluten-free Tamari and leaving out the fried wonton noodles and chow mein noodles. Make extra vinaigrette. It keeps for up to two weeks in the refrigerator and it is crazy good as a marinade. 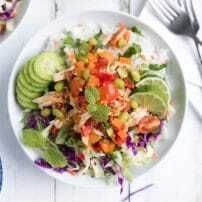 If you try making this Chinese Chicken Salad, please leave me a comment and let me know! I always love to hear your thoughts. 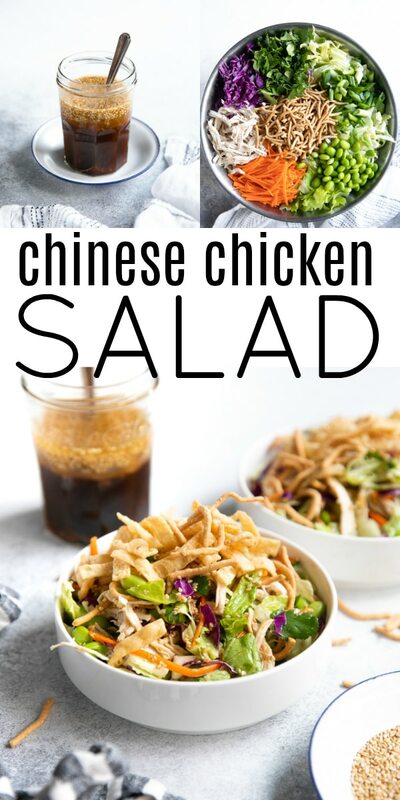 DON’T FORGET TO PIN AND SHARE THIS EASY AND DELICIOUS CHINESE CHICKEN SALAD RECIPE AND ADD IT TO YOUR NEXT WEEKLY MEAL PLAN! 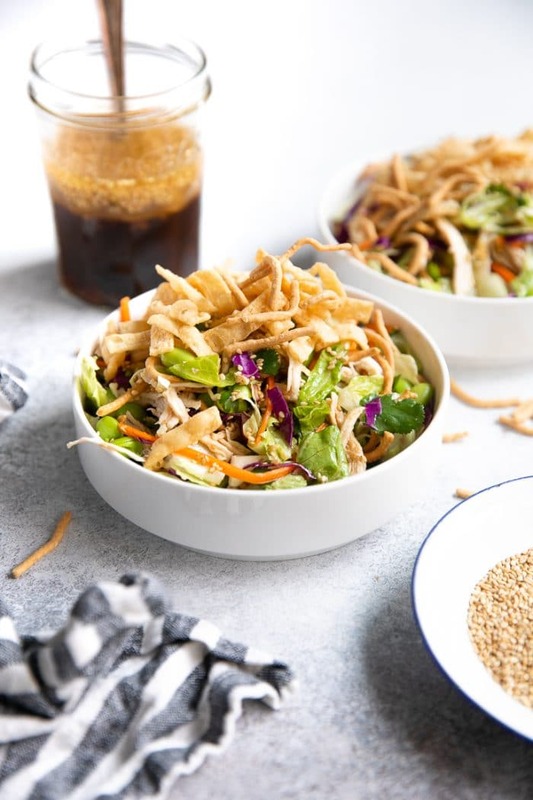 Fresh, crisp, and crunchy, this Chinese Chicken Salad Recipe is a mix of juicy shredded chicken, fried wontons, mixed greens, and the very best homemade Asian sesame vinaigrette. Prepare the vinaigrette. Add all ingredients for the dressing to a medium-sized jar and secure with a tight fitting lid. Shake vigorously until fully combined. Season to taste and set aside until ready to use. Poach the chicken. Bring a large pot of water to a boil over high heat. Add the chicken and return the water to a rolling boil. Remove from heat, cover, and set aside to "poach" (cook) for approximately 25-30 minutes. Carefully remove chicken from the pot and set aside to cool before shredding. Prepare the salad. 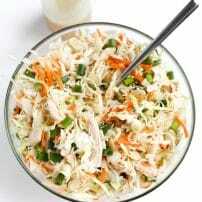 Add all ingredients for the salad, including the shredded chicken, to a large mixing bowl and toss well to combine. Serve. Drizzle the salad with vinaigrette, mixing well to evenly combine. Or, serve salad in individual bowls and drizzle each bowl with the desired amount of vinaigrette. 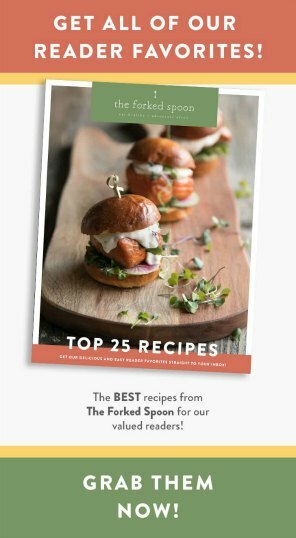 Originally published in 2016 and updated with new images, post text, and recipe on March 24, 2019.